Editing a longer video to feature newsworthy bits is a far cry from engaging in James O'Keefe-style deception. Sunrise Movement posted a video on February 22 showing a tense discussion between young climate activists  and Sen. Dianne Feinstein (D-CA). The group's Bay Area chapter streamed  the exchange live on Facebook; a shorter version  was subsequently posted on Twitter to fit the platform's 140-second video limit; and the group also shared the link to the full Facebook video later that night . Despite the longer versions posted elsewhere, the Twitter video prompted ill-considered accusations that it had been deceptively edited to paint Feinstein in a bad light, with people baselessly comparing the incident to the malicious work  of O'Keefe's Project Veritas. This is how @SenFeinstein  reacted to children asking her to support the #GreenNewDeal  resolution -- with smugness + disrespect. After the initial video went viral, several commentators pointed to the longer version of the encounter as evidence that Sunrise Movement had maliciously misrepresented the exchange. 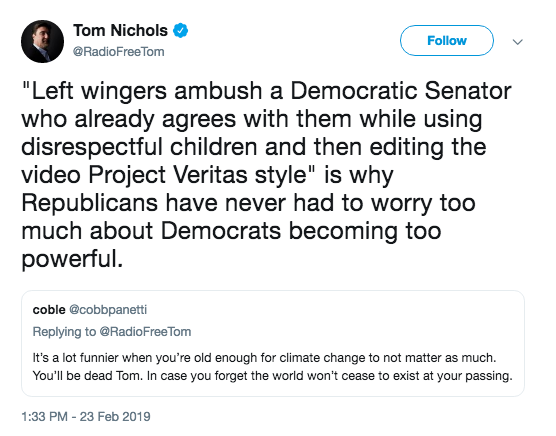 People like “Never Trump” conservative Tom Nichols invoked Project Veritas, the notorious conservative group headed by O’Keefe. Nichols was far from the only person to invoke O'Keefe. O'Keefe has made deceptive editing of footage and doctored videos synonymous with his and his project’s name. He and his group have a well-documented record  of peddling misinformation and staging stunts that backfire . Notably, Veritas’ modus operandi relies on deception, as its staffers routinely lie about who they are with the intent of filming targets in embarrassing situations, whereas Sunrise Movement activists identified themselves transparently . In one incident, O'Keefe attempted to lure a CNN reporter onto a boat filled with  "sexually explicit props." In contrast to O'Keefe's antics, there is no question that Feinstein knew exactly whom she was discussing policy with. And the longer and shorter versions of the Feinstein are clearly similar in tone and content. 2 - FACT: Sunrise put out the full video ourselves! We’ve never hidden the full video because the full version is also bad. You can check it yourself here: https://t.co/oSIkbnJuQi . I've seen a number of people suggest that last night's Feinstein video was akin to O'Keefe's work. No. Ew. No comparison. Even if you disagree with how the Feinstein vid was edited, they're fundamentally different things. Entirely different. One can have a reasonable discussion about what policies are best suited to addressing climate change. But that discussion cannot happen  without a shared understanding of just how bad the situation already is . Likening these climate activists to one of the worst smear merchants around is not just profoundly unfair; it makes suitable action on the climate crisis even harder to achieve.